Early custom solo lp from the female half of Farrell & Farrell. 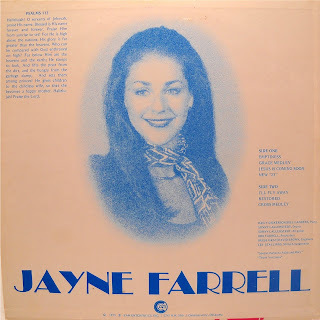 Jayne was also a member of the rock group Millennium who have a highly sought after private press from that same year. Although a lot of the participants from that recording are here as well (keyboardist Bailey Dickerson, guitarist Sonny Lallerstedt, and producer Bob Farrell), the comparisons end there. Two of the tracks are lengthy medleys of hymns that are quite traditional in their presentation. As for the rest, there’s the folky light-rock opener ‘Emptiness’, country renditions of ‘Jesus Is Coming Soon’ and ‘ I’ll Fly Away’, and mellotron-backed covers of ballads ‘New 23’ and Bob Farrell’s ‘Restored’ (which also appeared on the Millennium lp). Not nearly as cool as what the credits and pink/blue negative image cover portend. (The Archivist by Ken Scott, 4th Edition). Thank you to both you and Ozark Ken for this gem. I am mloving the Dove, Millenium, Bill, Dave and Mary scene at the moment. This is a missing piece in that puzzle. It is interesting to see Bill Landers is on this album. Does anyone know what happened to him? Thanks for this. Have always liked Farrell and Farrell. Never heard this one before.